Finding inspiration for a new campaign is tough. The first problem is you and your players need to be excited about your campaign concept. If you aren't excited, the campaign will fizzle when you lose interest. First, you'll lose your enthusiasm. Then, you'll get bored. And then, it'll feel like work. If your players aren't excited, they either won't show up, or they'll play poorly. Bored players drive a vampire stake into good gaming and will make you very frustrated. When I was creating a new campaign recently, I couldn't think of a good concept or seed. Then inspiration hit, but when I pitched it to my players they were lukewarm on the idea. So I was back to staring at a blank page again, scrambling for ideas. Long story short, I turned to my 11,000 smart and creative Roleplaying Tips readers. I shared with them my fast and easy Campaign Seeds Formula and held a contest. The campaign seeds poured in. Winners were drawn, prizes handed out, cheers all around. And I got more campaign ideas than I could shake a wand at! So Gem Cutter Robert and I took the best entries, compiled them, and polished them up. About 41 hours later, we ended with about 128 amazing, creative, and diverse fantasy campaign seeds all using my Campaign Seeds Formula. 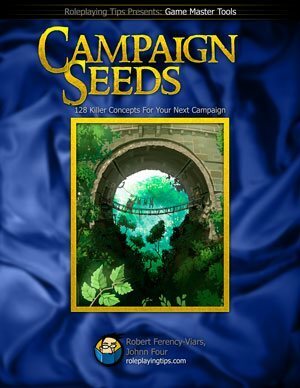 Then we added a chapter on what the Campaign Seeds Formula is and how to make your own seeds using it. 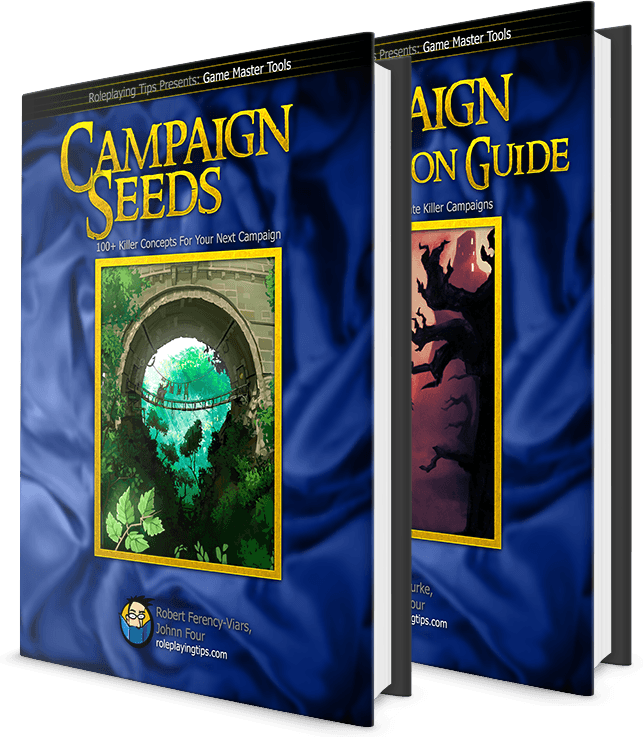 We put all the seeds and the tutorial into the book I'm offering you today: Campaign Seeds: From Zero to Killer Campaign Concept. It's 109 pages long and available for instant download after purchase. You'll never be stuck for a campaign idea again. You can mashup seeds from the book to craft your own unique concept, or your can use the 4 step formula to build your own from scratch with the 128 seeds in the book to serve as actual examples to guide you along. This book will help you add a new life-long GM skill to your GM toolbox. I just downloaded Campaign Seeds. Obviously I haven't read them all, but it is a beautiful piece of work. I'm in the middle of a campaign right now, but your process has inspired me to sit down this afternoon and use it to plot out where things are going next. So it will be like a new campaign in that it is a new phase. So I've not only been given fish, but taught to fish as well. The book is 109 pages long. While the contest was about generating awesome ideas for campaign concepts, I wanted more resources to help take my chosen concept from idea to campaign plan. So I rounded up some favourite articles and essays from RoleplayingTips.com and CampaignMastery.com and compiled them into a second complete book: The Campaign Creation Guide. This is exactly what you need to flesh out your idea into a campaign skeleton. The 12 Steps to an Epic Campaign method alone will probably get you the most thorough campaign plan you've ever developed. 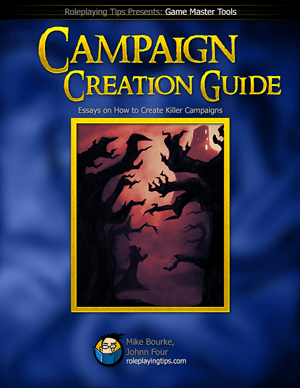 And the method aims at not just creating any old campaign - it guides to to crafting an epic campaign. And it delivers. I am proud of my work and I stand behind it 100%. I also know it's risky buying books online, because you can't stand in a store, hold a book in your hand, and flip through it. You have a full 60 days to try Campaign Seeds: From Zero to Killer Campaign Concept. When you purchase from my secure, https, encrypted shopping cart, you will be able to download your book immediately. And if you don't like it - if I roll a 1 for you - just ask for your money back. Email me anytime to get a refund. No hassles, no questions, I will simply give you your money back. If you'd care to share how I rolled a critical miss so I can improve my book, that would be wonderful. But that's totally optional.